Propolis is known as nature's antibiotic, with powerful antioxidant, anti-inflammatory, anti-bacterial, anti-viral and anti-fungal properties providing powerful support to the immune system. Propolis is a natural substance made by bees to sterilise and protect the hive against infection. Resins collected by honeybees from the bark and sticky buds of plants are mixed with beeswax and enzymes, producing a powerful substance rich in bioactive compounds with potent protective effects. Manuka Health BIO30™ New Zealand Propolis has particularly high levels of these important bioactive components. 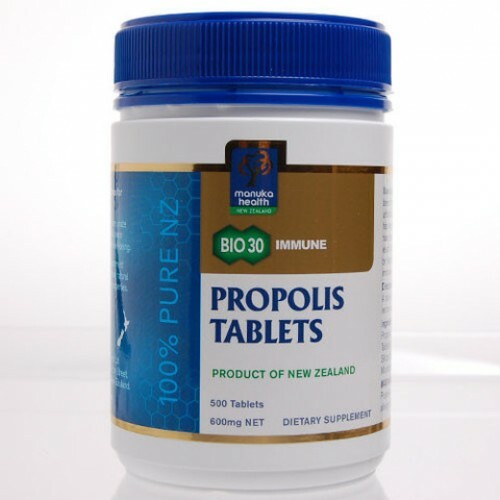 Containing at least 38 valuable bioflavonoids, phenolic acids and esters including CAPE (Caffeic Acid Phenethyl Ester), BIO30™ New Zealand Propolis is certified to contain a minimum of 30mg/g of total bioflavonoids and CAPE. WARNING: Propolis may cause allergic reactions in allergy sufferers. Not suitable for children under 2 years of age.